I can hear you calling! You may have heard the word transducer applied to speaker drivers and microphones. Transduction is a fancy word for conversion and, just as a speaker converts electrical energy into mechanical energy that we perceive as sound waves, the microphone converts sound waves into electrical energy. The two main types (here we go again!) of microphone are dynamic and capacitor. The first working microphone was the carbon microphone invented by Edison in 1876 and was two plates with carbon granules between them. A voltage is applied across the metal plates, causing a small current to flow through the carbon. When the plates vibrate in sympathy with sound, this current changes. But in the studio, we use the condenser mic and the dynamic, moving-coil mic. There was some limited use of ribbon mics and many reacent entries into this section of the market have been of very poor quality and more of a gimmick than a useful series of tools. There are however many good ribbons out there from the more responsible manufacturers. No, don't worry! I am not going to tell you how microphones work! If you don't know, look it up. A technical description to be cut and pasted into somebody's homework is not the purpose of this website. I am however, going to talk about microphones in general and mention a few that are my favorites. I might even make you think again about what mic to put where. At the moment, the whole of the microphone market has become a terrible mish-mash as a direct result of the importing of very cheap (but not so chearful) Far-Eastern products at very low prices. Well, I say very low, very low compared to what we were paying a few years ago. You can now get condenser mics for as little at £100 that on first listening, sound very good indeed. They sound sharp and clear and, as they say in the reviews in amateur recording magazines, 'cut through a mix.' So, if they are that good as some people claim, why do professionals still not use them? Is it our old friend the snob effect? When you get to work with a top quality microphone and desk, you get used to 'pulling' things out of the signal to get an effect, or pushing parts of the frequency spectrum back without loosing anything, without it sounding as if something strange is going on and (most importantly) without distortion. There would be no point in bringing the highs forward in a voice, piano, or drum overheads, if the result was loads of edgy distortion flooding the mix. Let's be clear here - these budget mics (and their budget counterparts in the rest of the signal chain, come to that) distort. As they say in Yorkshire, "You don't get ought for nought!" They may sound pretty damn good for the price, but it is when you try to work with that sound that things start to go wrong. You may want to pull the highs on the overheads forward by 12dB and then bring them right down in the mix. Well, you can't because they distort and pulling the highs forward by that amount just shows up all the distortion. So these mics and all the other super-cheap budget stuff that is flooding the market may be great for the amateur who just wants to hear a sound, but they do not work for the professional or even for the amateur with somewhat elevated expectations. If a component in the signal chain is of poor quality, then everything will be brought down to that quality. A chain is exactly that, a chain. If there is a ropey mic-pre or eq in there, then you will not hear much difference between a high class mic and some piece of cheap tat. That goes for monitors as well, by the way! Using cheap pieces of equipment 'uneducates' the ears. If you keep hearing distorted highs, then you begin to expect that sound and even confuse it with genuine clarity. This can end up with you not being able to tell the difference between the distorted sound of a cheap mic or other component and the top-end clarity of a well-built mic. Last, but by no means least, watch out for badging! Now, if you don't know what badging is, this is the practise of taking some item and sticking your logo (or badge) on it. There are all sorts of shades in between, such as taking a cheap mic and replacing some of the parts to improve performance, or putting the mic in a nicer housing and giving it a better presentation box. The problem is one can never be sure if a product is of good quality, until one has used it for a while. Mics in particular, only really show their true colours during the mix and mastering processes. It is then, when you are working on the mix, that you discover whether the quality of parts of the signal stand up to deeper scrutiny. Neumann makes a pile of good, cheap mics. People tend to just see the sticker price on an M149 and assume that all Neumann mics are going to break the bank. Well, if any manufacturer makes fantastic mics for very low prices, that manufacturer is Neumann! The list of good mics that cost less than £500 each is fairly long, but I'll start with a star, the KMS105. This is originally a live mic, but it works brilliantly in the studio, especially for rock and jazz voices and costs only £325 by the usual mail order companies. If a good stereo pair is what you desire, the KM 184 stereo set costs just £715. The BCM705 gives good warm vocals. Yes, I know it is a broadcast mic, but it works really well on singers, as well as vapid DJs called Kevin. If your pocket book can run to the TLM series, then there is a bewildering array of really great microphones from Neumann and to my ears, the TLM103 sounds like the U87 (well, the new version of the 87 anyway) and costs less than half. Things to avoid from Neumann are the accessories, which are just wildly over-priced - unless you really feel that you should pay over £200 for a cradle or a staggering £40 for a two-bit mic clamp! DPA make some great budget mics around their sub-miniature series that allow you to use them in places other mics do not go. Top of my list is the 4061, which is so small, it can be 'blue-tacked' onto a violin bridge without affecting the sound. It is also the most genuinely omni-directional microphone I have ever tried, making it an ideal candidate to double as a test mic. The 4061 (and its high sensitivity brother the 4060) make ideal mics for Decca Tree arrays, boundary mics and for kunstkopf stereo recordings. At £215 pounds each, these are really a bargain! Unfortunately, AKG has been blotting its copybook lately with some cheap imports, but hidden in junk basket of cheap tat at the end of the aisle is a series of real microphones, the 300 (so called 'Blue Line') series, which is a body plus capsule system. The 300 body come bundled with the cardioid 91 capsule as the AKG C391 and costs about £180. This is a good, sweet-sounding mic that works for things like piano, overheads and orchestras. It lacks the 'sparkle' that comes with a very fast response rate, but sometimes that is a good thing. Other capsules with other characteristics are available, but they cost quite a good bit more and are not really worth the extra, unless you really need them. On the dynamic side of things, there is not much to say. The cheap imports are truly dreadful. The good ones all cost a great deal. The only exception I can think of is the Audix D-Series for drums and the D6 in particular, which sells for about £160 and is the only mic I use for kick drum. Here is a list of some gems to watch out for. If your favourite old mic is not on the list, it just means I do not know it - or I do know it and do not like it (e.g. the AKG D12). D224, D202 D222 and the D200 all used the patented AKG two-way transducer system and are superb mics for voice, horns, parts of the drum kit and lots of other things. The 200 series are fantastic snare mics. Also watch out for the D1200, which was AKG's answer to the SM57, only far better! Of course, everyone would like to get their hands on an original C12, but the number of fake copies floating around is pretty massive, so you have been warned. In particular, watch out for offer of old C12s that have been 'rebuilt' or otherwise improved. Very many of these are Chinese copies that someone has doctored to look like an original. Sometimes the bodies are original, but the insides have been replaced with the insides from a cheap copy. The old insides were either totally shot, or put inside the body of a copy, therefore making two C12s out of just one! The C12 was also sold as an OEM version by Siemans as the SM203 and the SM204 and by Telefunken as the M251 and the ELA-M251. Electrovoice produced more beautiful mics than I could possibly list here. Watch out for the DS35, the standard vocal mic for live TV in the 60's. Also look out for the 664 'Sound Spot' which not only sounds silky and smooth, but really looks fantastic. Two of these as audience mics are unbelievably good, compared to some of the mics we get today! Altogether, EV mics were mechanically better made and as a result, looked better than most others. You can always find a use for any of the RE series and often (with the exception of ever-popular the RE20) they can still be picked up for not too much money. Everybody has heard of the SM57 and the SM58, but Shure made more brilliant microphones than I could possibly list here, so I'll just highlight the ones that tend to be sold for a small fraction of their true worth and in their day, were (and of course still are) microphones built for the very highest professional standards. 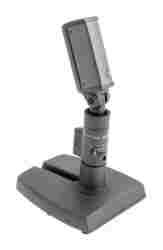 If you are looking for the best in ribbon mics, look for the Shure Unitron (later called the Uniron to avoid being confused with a telescope manufacturer of that name). This carried the model number 330 and 333 and was based on the earlier 300 and 315 - all of them good! The most famous of all ribbon mics ever built was the SM33 and was the mic used for so many years by Johnny Carson and Shure even had a special one made for him with the inscription "Johnny's mic . . . Not Ed's . . . Not Fred's . . ."
Shure made very high quality dynamic mics, such as the SM54 and the SM59 that seem to have been forgotten today, but still make brilliant mics for all kinds of things, especially drums and hi-hats in particular. Altogether, Shure made hundreds of types and models, incuding some condenser models that I have seen sell fairly cheaply, such as the SM80 and the SM102 that used to be extremely poular in their day.